The labor participate rate has fallen to 62.7%, the lowest rate since 1978! While the quoted “unemployment rate” has dropped back into the 6-7% range (still much higher than under President Bush), the U-6 unemployment rate is still greater than 12%. U-6 includes workers “marginally attached to the labor force” or “working part-time for economic reasons.” If you’re a middle class worker in either category, I am confident you’d want to be counted in the unemployment rate as life is NOT good. By the way, the U-6 rate under President Bush was in a range from 7-9%. Under Obama it has ranged from 11-17%. The number of Americans needing food stamps just to survive has risen from 32 million to 47 million. Yes, 15 million new food stamp recipients under Obama. When you can’t work, you still have to eat. A staggering 92% of African American teens are unemployed. If you can’t get that first minimum wage job, your likelihood of having a better job in your 20s is very low. Continued efforts to raise the minimum wage compound this problem. Energy costs have risen under Obama’s hyper regulatory administration and his refusal to allow the Keystone Pipeline will compound this. Healthcare costs have risen by over 100% in many states. The promise to “bend the cost curve” with Obamacare has been fulfilled. The curve bent upward and drowned many middle class families in the process of taking their family doctor away from them. The poverty rate rose to a 50 year record. FIFTY YEARS! There are more than 50 million Americans now living below the federal poverty level. The poverty rate for African Americans soared from 25.8% to 27.2%. 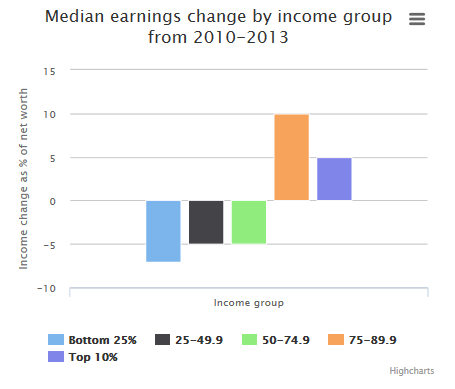 Finally, the median earnings of all but the top 25% have fallen. The following chart shows this graphically. So, when President Liar stands before the cameras tomorrow evening and talks about helping the middle class, I suggest the middle class tell him no thanks. They don’t need this kind of help any more.